To me, it’s amazing that few people seem to really listen to what the Scoundrels say, but how what is said, is said. Even though I think the consensus from the presidential debate was that Romney slaughtered Obama, the “winner” of the Vice Scoundrel debate seems to divide along partisan lines, but I know I saw less eye-rolling and heard less sniggering when I coordinated an afterschool program for at-risk middle school students. Wasn’t the assassination of the U.S. Ambassador in Libya a massive intelligence failure? Actually, according to recent testimony on Capitol Hill, it was revealed that State Department personnel in Libya had repeatedly asked and been denied more security forces. So, surprise, the Vice President lied through his teeth when he said that the Obama administration was “unaware.” Last time I looked, the State Department, including the Secretary of State, is a cabinet level institution that definitely is part of the administration. I was against the “humanitarian intervention” in Libya from the beginning and am appalled that in the interest of global resource extraction, tens of thousands of innocent Libyans were killed. The attack that unfortunately killed the ambassador and three other Americans was in reaction to the invasion and corporate occupation of Libya: it’s called, Blowback. Was it appropriate for Romney to criticize president Obama during Libya crisis? Which Libya crisis? The one where the US collaborated with NATO to murder tens of thousands of innocent Libyans or the one where four Americans were killed? Besides that clarification, I think any criticism of the President of the USA is valid and necessary, unless it is used for purely partisan political posturing as it seems was Romney’s intention. How effective would a military strike against Iran be? I, and my party, are adamantly opposed to violating the sovereignty of any country and believe that a military strike against Iran would be disastrous and lead to further unnecessary civilian deaths and would obviously lend greatly to further destabilization of the region. I call for an end to the current wars and closing the approximately 900 bases the US maintains on foreign soil and using the trillions that would be saved on education, health care, infrastructure, clean energy, and housing, (among other things). What’s worse: another war in the Middle East or a nuclear-armed Iran? The Prime Minister of Israel and politicians in the US are lying when they say that Iran is “months” away from a nuclear weapon. There have been numerous intelligence estimates and independent reports denying these specious claims. Having said that, the country in that region that actually possesses hundreds of nuclear weapons is Israel and Israel has demonstrated repeatedly that it is a paranoid state that has no bottom limit to the lengths it will stoop to destabilize the region to protect its colonial project. This one is a no-brainer to me: Another war in the Middle East would be far worse. Can you get unemployment below 6% and how long will it take? The Peace and Freedom has a comprehensive program that, if implemented, would bring full-employment for those that seek it and a Basic Guaranteed Income for those who need time off for whatever reason: childbirth, childcare, disability, age, etc. We support the establishment of a Universal Basic Income (UBI) to alleviate poverty and homelessness. We call for a 30-hour work week for 40 hours’ pay and abolition of forced overtime. We demand paid parental leaves and time off work for childcare. Defend workers’ rights to organize, form union caucuses, strike, and boycott. Federally funded public works programs to rebuild the nation’s infrastructure and restore the environment. I believe if these programs were implemented, full-employment could be reached within the first two years of any administration that did so. Will benefits for Americans have to change for Medicare and Social Security to survive? I say that they had better NOT change unless it’s to ensure that our seniors and disabled are taken care of in the best way our society is capable. Of course, if the vast wealth and resources of this Empire were re-prioritzed to serve human need instead of the War Machine and corporate greed, there would be enough money for compassionate and fully funded social programs. If your ticket is elected, who will pay more in taxes, who will pay less? Since the US has the largest income disparity of any “industrialized” nation, I believe that the tax codes, from taxing real property to taxing unearned income should be eliminated for middle and low income earners and a greater burden should be placed on corporations that steal from the public good but don’t give anything back. Unearned income should be taxed at a rate that would contribute to a more just distribution of wealth. I also advocate taxing churches and taking the cap off of social security taxes so more of the burden falls on the wealthy. Why not leave Afghanistan now? Yes, why not…and a better question might be, “Why did we go there in the first place?” Afghanistan did not attack us on 9/11 and that country and its people have paid a high price for the fact that their country is in the way of a gas pipeline and has vast precious metal resources. The resources of Afghanistan belong to the people, not the US Empire and other multi-national corporations. What more can the U.S. really accomplish? What “more” can the U.S. accomplish? What has it accomplished except for further destruction of that country, more violence, the rebirth of the opium industry and increasing tensions with Pakistan? What conditions could justify U.S. troops staying in Afghanistan? What was the military reason for bringing surge troops home from Afghanistan? What was the military reason for sending the surge troops? Besides the uncounted civilian casualties, more US troops have been killed there since Obama has been president for less than four years than the entire time Bush was in office. The U.S. assisted rebels in Libya; why doesn’t the same logic apply to Syria? Furthermore, there does not seem to be a consensus on the composition of the so-called Free Syrian Army which could have elements of our supposed mega-enemy, Al Qaeda. What happens if Assad does not fall in Syria? We respect the sovereignty of Syria. But, again, is this question for real? Osama bin Laden, Saddam Hussein, Moammar Qaddafy, etc, should have been a big warning to Bashar Assad—the US will use you to commit its dirty work and be your friend until it’s more fun or convenient to demonize you and remove you from power. What is your criteria for intervention in Syria? What role has your religion played on your personal views of Abortion? None. And I don’t think “personal views” are relevant in something that is a right: a woman’s full reproductive control over her own body. 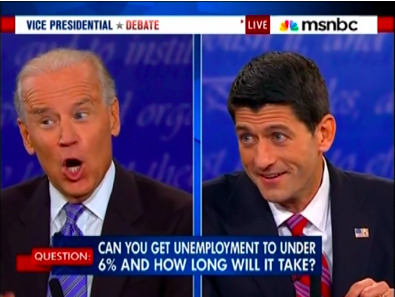 It doesn’t matter what Ryan or Biden, or even I, think. It’s up to each individual woman. If the Romney-Ryan ticket is elected, should those who believe abortion should be legal be worried? I don’t think so since George W. Bush and every Republican president since the Roe v. Wade decision has been opposed to abortion and it still stands. In our administration, abortion would be available on demand and included in a national health care program. The Obama administration has been a disaster for world peace and our economy here at home. I am not willing to give Romney/Ryan a shot at these important matters, either. True change will not and cannot be achieved in the institutions that created the problems, or with voting for the twin-evils that permeate our lives. We now live in a dictatorship of the one-percent with a seemingly peaceful transition of power every four to eight years. Nothing changes except the face and continuing to vote for the twin-evils thinking anything will change is Einstein’s definition of sanity. A vote cast for Romney or Obama is a vote for war and economic austerity for us. If you support war, then vote for Romney or Obama. If you support harsh austerity measures, then, by all means, vote for Romney or Obama. If you support the rise of Police State American—then—you know what I am going to say. Send a message to the oligarchy this November—vote 3rd party or independent.